'Tis (almost) the season, and when Christmas Eve finally arrives, Santa Claus fans all over the world will be able to track his minute-to-minute whereabouts, with the help of some friendly elves and Google Earth. Be sure to visit earth.google.com/santa starting on December 12th to learn more. Santa Tracker is a KML file, viewable in Google Earth that shows a 3D SketchUp model of Santa flying around the world delivering presents on the evening of December 24th, Christmas Eve. This year, Santa will also be hiding some giant toys in Google Earth. Beginning on December 12th, Santa will leave a clue outside of his house at the North Pole up until his flight on December 24th. Each clue can be used to find a city where a giant SketchUp model of a toy is hidden. Each day, the location of the toy from the day before will be revealed. 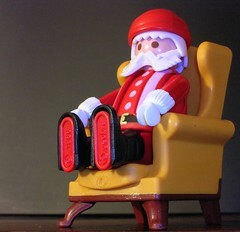 Don't forget to visit the website on December 12th to see Santa.